Junior High can be very scary, especially if you're… different. That's the case for JV, Mikey, Nancy and Laurie. 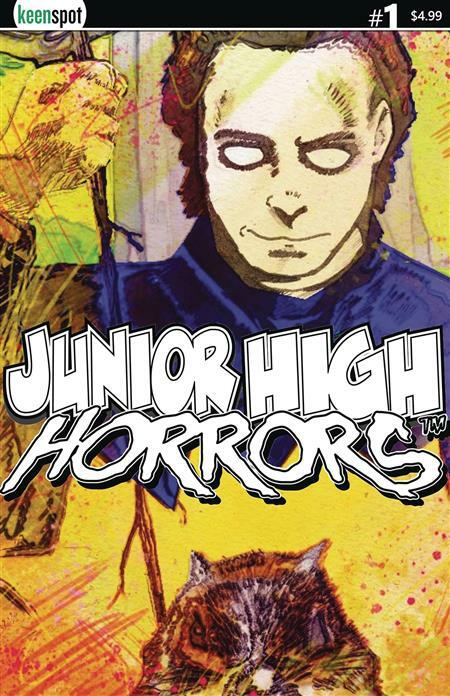 When you cross horror film iconography with the style of a retro Saturday morning cartoon, you get Junior High Horrors! This all ages parody series will delight middle-aged horror fans and impressionable young children alike. In this issue: As JV preps for his day, you get the feeling school isn't his favorite place, and neither are his awkward conversations with his momma. Laurie finds Mikey outside poking at creatures while Nancy and her imaginary friend Frederick deal with the mean girls of the school. All this as they plan a trip to King Stephen's Petting Zoo.